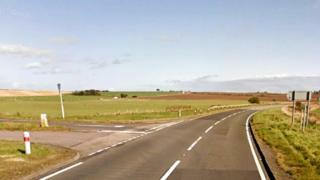 Major improvements to an Aberdeenshire junction may not be "economically justifiable" based solely on the number of accidents that have happened there, a council report has said. No fatal accidents were recorded at the Toll of Birness from 2013-18, although one serious crash and five slight injury incidents were recorded. The figures did not include a fatal accident that happened nearby in 2017. Campaigners have been calling for the junction to be modified. The council told BBC Scotland that police data it received defined a collision at a junction as being an accident within 20m of it. An Aberdeenshire Council briefing note said: "BEAR Scotland have agreed that a roundabout would be the preferred solution to reduce collision risk at the junction and improve traffic flow. "However, they are also of the view that it is not economically justifiable based solely on the recent accident history alone." Ellon and District councillor Gillian Owen said she was disappointed by the finding and that the accident statistics alone did not tell the whole story. She said: "You've only got to drive on the A90 from Ellon to Peterhead and past the Toll of Birness junction to realise the junction is a bad junction. "It might not necessarily be that accidents happen at that junction, they happen either side of the actual junction. "I think it's crucial we keep up the hard work - this road does need urgent action." Ewan Wallace, the council's head of transportation, said: "Previous work has looked at the Toll of Birness junction in some detail. "As set out in the briefing note that has been prepared for councillors, any case for intervention would need to consider not only recorded historic accident statistics, but also future traffic growth and pressures, and also wider economic impacts."